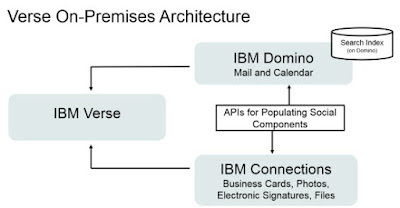 Today IBM has released the brand new IBM Verse on premises (VOP) for Domino 9.0.1 so during the italian evening after the docs was released too I've removed beta3 from our servers and than I've installed and tested this new release. VOP should be considered the evolution of IBM Domino experiences for on premises environments. 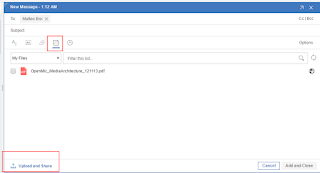 in addiction to Domino entitlements like Connections Files 5.5 and Profiles 5.5 Docs viewer should be included too to guarantee the preview of the mail attachements. I'vent find yet the entitlement documents but it should be like anticipated during ICONUK session by Barry Rosen. Here the first news, VOP is available only for Windows64 and RHES so SLES , AIX or IBM i that are supported for Domino 9.0.1 FP7 are at the moment excluded for VOP. During sw setup a dedicated Domino HotFix included in the VOP package and denominated 901FP7HFVOP is required. The build of Domino server on REHS will be Release 9.0.1FP7HF370 . To be able to enjoy most of important features Connections 5.5 at least CR1 is required . Setup steps are not hard but admins must follow in right order and carefully all steps especially with the optional update the IBM Connections profiles (needed if Connections 5.5 was migrated from previous releases). 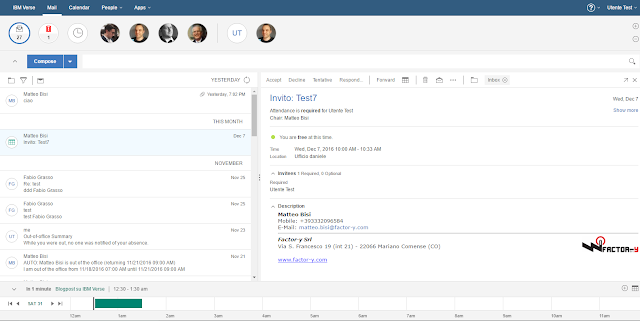 on the upper side we have the "important me bar" with most important contacts so we will be able to perform a mail search just clicking over the contact pic. At the beginning of the bar we have "Need Action" and "Waining for "buttons so we can use this categories from the email deciding when we have to finish a task about an email or we have to receive something to someone. At the bottom of the page we have the calendar bar with all appontements. 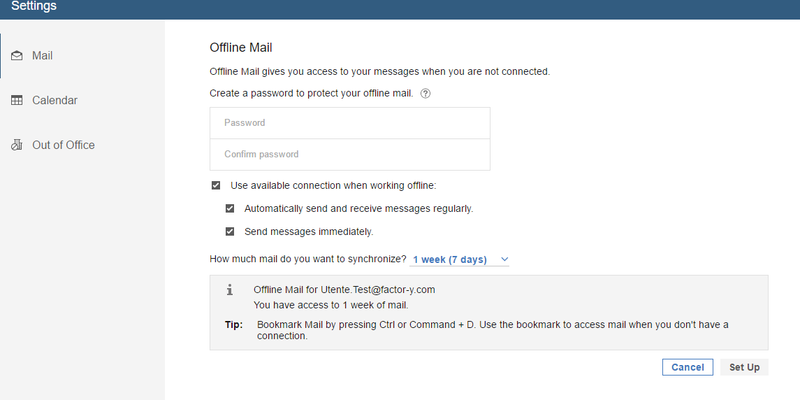 Another feature available is the Offline Mail that allow to save at max 14 days. Mail will be protected by a local master password. For attachements the integrations with IBM Connections files and Box is available so we will be able to attach directly files from this service like in the following example. Calendar is right now basically a link to iNotes calendar so this broke the user experience going back to iNotes 9.0.1 . Search functionality are guarantee by Domino engine so we are not able to use search like we usually do inside Verse cloud. I think IBM Domino search index are quite good but the user experience with Solr search on Verse cloud are in my opinion on another level. In my opinion this VOP release should be considered a first step to a marathon because I'm a Verse user (and fan) from the beta and I think VOP are missing too many features compared to the cloud version. I hope and I think during next weeks some of the features like Sametime integration will be added . Download part numer is CNGD8ML that include both Win64 and RHES packages. 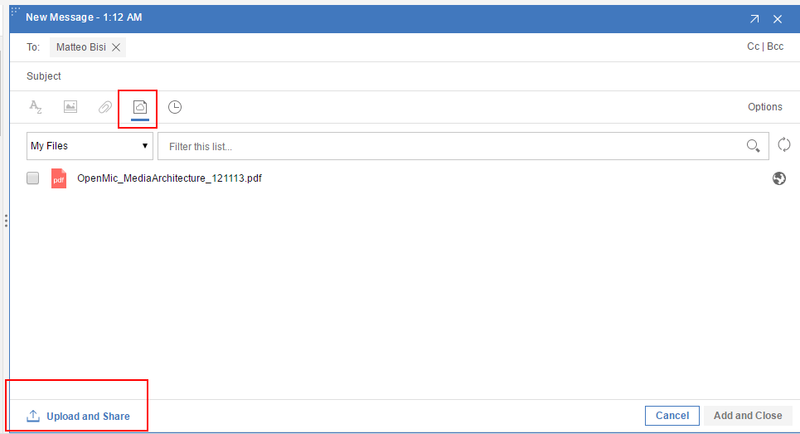 Here at this link you can find the admin docs with setup steps at this link the user documents.. I have just installed VOP and I found that also contacts are just linked to the old iNotes. Hello Yussef , unfortunately also contacts like calendar looks to be linked to iNotes right now. Anyway i have not same console message when i go to contacts or i use VOP , reading the messages i suggest you to check the FTindex because was look missing or corrupted. Regarding the java exception, it was my fault I ommitted the ssl configuration so my server was running on HTTP. It seems that SSL is required for VOP. I'am trying to put IMSMO on my VOP server, and I was looking if anyone has tried this config before. If you have any comment/advise about I will greatly appreciated that you share your experience. mmm sincerely I've never tried it. It can work for sure but you have to consider some things: 1) vop currently is requiring an HF and with IMSMO you could have for sure other requirements. Seconds i suggest you to evaluate the server charge and check users Vs Hardware . It could work but you could have some issue managing this server in the future. If this is a production env i suggest you to separate services, vop/mail on a server and IMSMO/traveler on another one. - If there any way to connect to a remote IBM Connections provider, but still keep the Domino server in-house ? - What you be your best arguments/tips to convince any customer using Verse tomorrow ? Hello Unknown, strange name you have ;-) . 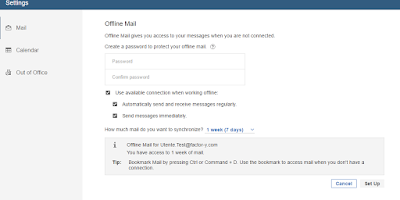 As i wrote VOP 1.0 is a good start but in my opinion is a little bit early to push that to customers because currently are missing some hits like sametime integration or calendar and contacts in VOP style , and some others. In my opinion VOP should be consider the natural evolution of a Notes client or iNotes , it's nice, it's well organized and works correctly with some useful features like "important me bar". I'm a huge Verse cloud fan because i use it from the beta and because of that i dropped the use of my Notes client because works great and it's also integrated with connections and that's is important to me. If think could be possible to configure a remote IBM Connections with vop because vop needs to reach connections over 443 so you can have vop and connections in different sites (of course , a good connectivity between servers should be guarantee). Another good reasons because customers could migrate from notes to VOP is they have not to mantain anymore the clients and if your customer aren't using good management tools like Panagenda Marvel client sametime could be a huge work to do.